Dinosaurs have traditionally been divided into two groups, the Saurischia and the Ornithischia, on the basis of their radically different pelvic regions. Indeed, the hindlimbs play a large part in characterizing Di-nosauria and clades within Dinosauria. The saurischian dinosaurs, carnivorous theropods and herbivorous sauropodomorphs such as Plateosaurus and its descendants, will be reviewed here. The ornithischians are considered later (see pp. 205-19). Saurischian and ornithischian dinosaurs have long been identified by the so-called 'lizard hip'and 'bird hip' respectively. The more primitive structure is seen in the saurischians in which the pubis points forwards and the ischium back (Figure 8.3(a)), as in all basal archosaurs of the Triassic (e.g. Figures 6.2,6.3,6.4,6.8 and 6.9). In ornithischians, on the other hand, the pubis runs back in parallel with the ischium and there is an additional prepubic process in front (Figure 8.3(b)). Many dinosaurian characters ofthe hindlimbs are related to the acquisition of upright posture (see p. 143). The acetabulum is fully open and the pubis and ischium are long slender elements. The legs are brought in close to the vertical midline of the body (Figure 8.3(c)) by a shift of the articulatory surface from the top of the femur to a distinct ball on its inside. The reorientation of the limbs from a partial sideways sprawl has also changed the angle of the knee and ankle joints to simple hinges. The fibula is reduced, often to a thin splint, and the tibia has a 90° twist so that its proximal head is broadest from back to front and its distal end from side to side. The ankle and foot of dinosaurs are also distinctive. The ankle is dominated by a wide astragalus with a distinctive vertical process that wraps round the front of the tibia (Figure 8.3(c)), and the calcaneum is a small block-like element. In the foot, the dinosaur stands up on its toes (the digitigrade stance) rather than on the flat of its whole foot (the plantigrade stance), as most basal archosaurs (and humans) do. The outer toes, 1 and 5, are much reduced and the dinosaur really uses only the middle three toes, 2,3 and 4. The theropods include all the flesh-eating dinosaurs and they ranged in size from small turkey-like forms to the 6-tonne giants of the Cretaceous. The her-rerasaurids from the Carnian of South America (see p. 154) are often regarded as the first theropods, although others regard them as generalized basal saurischians or basal dinosaurs. There have been dozens of studies of theropod phylogeny (e.g. Gauthier, 1986; Holtz, 1994; Sereno, 1999), all of which agree on the broad outlines, but differ in details. 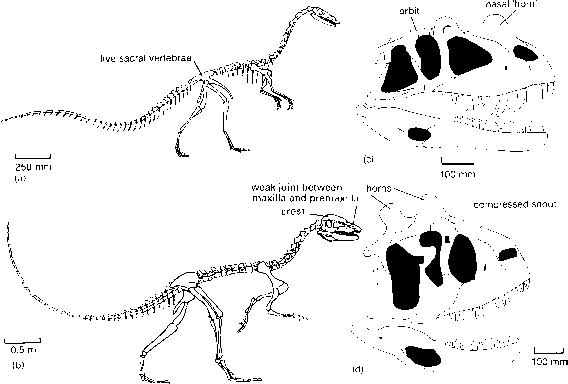 I use the most thorough recent analyses: Rauhut (2003) for the outline of major theropod groups, and Clark et al. (2002) and Maryariska et al. (2002) for maniraptorans and basal birds (see Box 8.5). Herrerasaurus, which has only the primitive two. It shows the coelophysoid character of an ischium that is two-thirds or less of the length of the pubis. A collection of more than 100 individuals of Coelophysis found together at Ghost Ranch, New Mexico includes animals ranging in body length from 0.8 to 3.1m (Colbert, 1989). Males and females could be identified on the basis of variations in body proportions, and one adult specimen gives evidence for cannibalism: it has a smaller specimen inside its rib cage. The Ghost Ranch site could represent the mass burial of a whole herd of Coelophysis that had been overwhelmed by some catastrophe, such as a flash flood. The skeletons are mainly complete and well preserved, but some are disarticulated, so the bodies were disturbed by water currents before they were buried. The ceratosaurs were close relatives of the coelo-physoids. Many ceratosaurs have crests and horns, perhaps developed most in the males, and these could have had a function in sexual display. Dilophosaurus (Welles, 1984) has two flat-sided crests over the skull roof (Figure 8.4(b)), whereas Ceratosaurus has a pair of 'horns' on the nasal bones (Figure 8.4(c)). These two genera come from the Jurassic of North America and they reached lengths of 5-7 m. Ceratosaur snout shapes vary from long and slender in Dilophosaurus to shorter and higher in Ceratosaurus. One unusual ceratosaur group were the abelisaurids, known primarily from the mid- to upper Cretaceous of South America, many of which had extremely short skulls. In some forms, such as Carnotaurus (Figure 8.4(d)), the frontal and parietal bones were hugely expanded into two triangular 'horns' over the eyes. 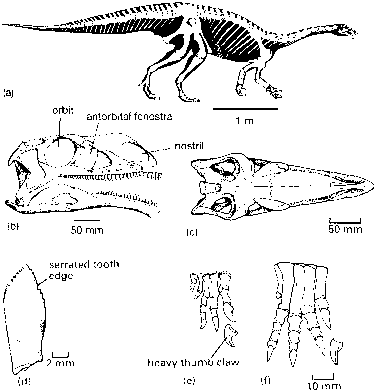 The remaining theropods, the tetanurans, are characterized by a number of features. They have a large opening in the maxilla, termed the maxillary fenestra (Figure 8.5), and the tooth row does not extend behind the antorbital fenestra. The dorsal vertebrae are pleuro-coelous, in other words, they have cavities on the sides, and there is a marked keel on the underside of the centra of the anterior dorsal vertebrae. stout first metacarpal. Carnosaurs include the mega-losaurids, essentially Megalosaurus from the Mid-Jurassic of Europe. Megalosaurus was the first dinosaur to be named, in 1824. Its relative, Magnosaurus from the Upper Jurassic of Europe (Figure 8.5(a)), was half the size of Allosaurus from the Upper Jurassic of North America (Figure 8.5(b)), which was 11-12m long (Madsen, 1976). The skull is short and narrow from side to side. The orbit is high and smaller than the antorbital fenestra, there are heavy crests over the orbits and the mandibular fenestra is much reduced. Further carnosaurs are best known from Africa. The spinosaurids, first reported from Egypt in 1915, are represented all over North Africa by their characteristic broad teeth. New finds, of Baryonyx from England (Charig and Milner, 1997) and Suchomimus from Niger (Sereno et al., 1998), show the characteristics of the clade—they have long spines on their backs, a huge claw on the hand, and an elongate, crocodile-like skull (Figure 8.5(c)). Were these regular predators on other dinosaurs, or did they perhaps snap up fish out of ponds and rivers? The carcharodontosaurids, such as the giant Carcharodontosaurus from Morocco, had a skull 1.6 m long (Figure 8.5(d)) and was one of the largest predatory dinosaurs (Sereno et al., 1996). The new discoveries of dinosaurs in Africa and in Madagascar are shedding light on continental movements through the Cretaceous (see Box 8.1). number of derived characters with each other and with the birds (see Box 8.5), most notably an enlarged maxillary fenestra and no serrations on the premaxillary teeth. The basal coelurosaurs are the coelurids, such as Compsognathus from the Upper Jurassic of Germany, one of the smallest dinosaurs at 0.7-1.4 m long. Its close relative from China, Sinosauropteryx, apparently has feathers: did feathers appear long before the origin of birds (see Box 8.2)? The tyrannosaurids, such as Tyrannosaurus, arguably the largest terrestrial carnivore of all time at 14 m long, radiated in North America and central Asia during the Late Cretaceous (Holtz, 1994; Brochu, 2003a). 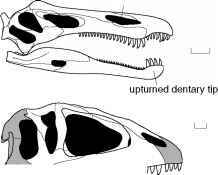 Tyrannosaurus has a large head (Figure 8.6(a)) with an extra joint in the lower jaw between the dentary and the elements at the back. This allowed Tyrannosaurus to increase its gape for biting large prey. It is debated whether tyrannosaurids were active hunters or scavengers. But they could certainly bite! Bones from the pelvis of a Triceratops show puncture marks up to 37 mm deep made by Tyrannosaurus teeth, and these indicate a bite force of up to 13,400 newtons, as powerful as the strongest bite of any living carnivore (Erickson et al., 1996). Tyrannosaur stomach contents show that they digested bones with acid, as modern crocodiles do, and a 1-m-long tyrannosaur coprolite full of Triceratops bones (Chin et al., 1998) and another with bones and putative muscle tissue ofperhaps a pachycephalosaurid (Chin et al., 2003) offer further intimate evidence of their feeding activities. Tyrannosaurids had tiny forelimbs equipped with either two or three fingers (Figure 8.6(b)), but these would seem to have been quite useless as they could not even reach the mouth. They may have been used to help Tyrannosaurus get up from a lying position, by providing a push while the head was thrown back and the legs straightened. These dinosaurs have a specialized ankle structure, the arctometatarsus (Figure 8.6(c)), in which the three central metatarsals (numbers 2-4) are firmly pressed against each other. Instead of being round in cross-section, the metatarsals are triangular, and metatarsal 3 is 'squeezed' at its upper end in such a way that it barely reaches the astragalus above, or is excluded entirely from contact with it. The arctometatar-sus may have had a dynamic function during running, where the three metatarsals bunched tightly at maximum loading and then sprang slightly apart as the foot was raised. This gave these dinosaurs a stronger metatarsus than in other theropods in which the three bones were not tightly bunched, but not so rigid as in birds, in which the three elements have fused into one (Snively and Russell,2003).